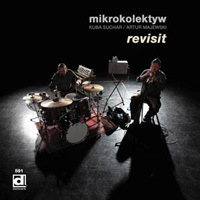 Mikrokolektyw, a duo composed of percussionist Kuba Suchar and trumpeter Artur Malewski, was born of the ashes of Polish jazz supergroup Robotobibok. They play acoustic jazz driven by elements of electronica and are known for their onstage energy, which has been infecting listeners for 6 years. The duo is notable for their sparse impressionistic style, which leads to compositions organically emerging on the basis of improvised elements. They have shared the stage with such jazz giants as Fred Anderson, Nicole Mitchell, Rob Mazurek’s Exploding Star Orchestra, not to mention such international artists as Matmos, Fennesz, Zu, Tied and Tickled Trio and Sao Paulo Underground. MIKROKOLEKTYW have appeared on stages in Europe, the United States and Japan, taking part in such prestigious festivals devoted to music and art as Chicago’s World Music Festival, the Unsound Festival (Krakow), Cerkno Jazz Festival (Slovenia), Depresja, the Off Festival, STIMUL and the Eurosonic Festival. When Raymond Salvatore Herman – film producer and producer of Delmark Records – met the duo in 2007, he immediately knew that their unique conception of improvisation would superbly suit this prestigious label. Mikrokolektyw became the first European avant-garde jazz group to record an album (Revisit) for this label, which has a 60 year history – clear testament to these musicians’ powers of execution and creativity levels. The 11 carefully conceived compositions presented on Revisit comprehensively render the complex nature of the duo’s tonal concepts. The rhythmic structures (played on a Moog) accentuate the multiplicity of allusions to various genres and musical forms, integrating disparate structures into one futuristic whole. Małgorzata Haduch – dancer/choreographer who graduated from the School for Dance Development in Amsterdam. It was on her initiative that Unfinished Company came into being in 2006. This group gathers together international artists from various art disciplines (contemporary dance, music, video art, photography). Unfinished Company mainly realize improvised shows in which music and dance co-exist and performance is conceived as an encounter between strong personalities, a clash of experiences, energies and imaginations. Małgorzata Haduch is associated with the Dutch free jazz scene, where she has collaborated over the past decade with such marvellous musicians as Ab Baars, Wilbert de Joode, Andy Moor, Arnold de Boer, Colin McLean, Onno Govaert and John Dikeman. For Małgorzata, working with live improvised music impels her to uncover dark, personal reserves of expression, forces her to relinquish control and converts sound into movement of extraordinary depth. Małgorzata’s artistic explorations and guest appearances (some as a soloist) have taken her over the last few years to such countries as Holland, Cyprus, Spain, Germany, Japan, Brazil, Chile, Peru, Costa Rica, Israel, Hungary and Slovakia. Her original stage language has crystallised over a number of years during which the most important projects have included such projects as a collaboration – lasting several years – with Amsterdam’s studioOT301, a stint as a guest choreographer at the Royal Scottish Academy of Music and Drama in Glasgow, a choreography project with the Peruvian theatre group Deciertopicante in the desert city of Tacna, the international DanceWeb programme in Austria and Solo Projekt in Poznań, as well as “50 Days” – a master class course and intense creative process run by cult choreographer David Zambrano in Costa Rica..
After returning to Poland in 2011, Małgorzata began collaborating with the Mikrokolektyw duo and two members of the Hera group – Ksawery Wójciński and Paweł Postaremczak. Their joint project “5of50” was supported by the Ministry of Culture and National Heritage. Another important encounter and experience was a production directed by Haduch, which featured the legendary dancer Krystyna Mazurówna. Małgorzata’s latest inititiatives are Film Tuesdays About Improvisation (at the Kika cinema in Kraków) and Free the Dance – a series of performances featuring improvising musicians as well as dancers, i.e. the art of improvisation combined with two artistic disciplines – music and contemporary dance. So far, the following have appeared in Free the Dance: the Chicago jazz musician Michael Zerang, Rafał Mazur, Artur Majewski, Ksawery Wójciński, Tomek Chołoniewski, Michał Dymny, Dominik Borkowski, Paulina Owczarek, Lori Duncan, Przemek Kamiński and Magdalena Ptasznik.